This is really a four-car test. 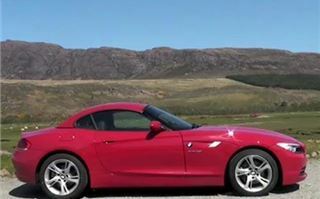 We drove the new BMW Z4 sDrive 23i manual and 35i DCT auto. 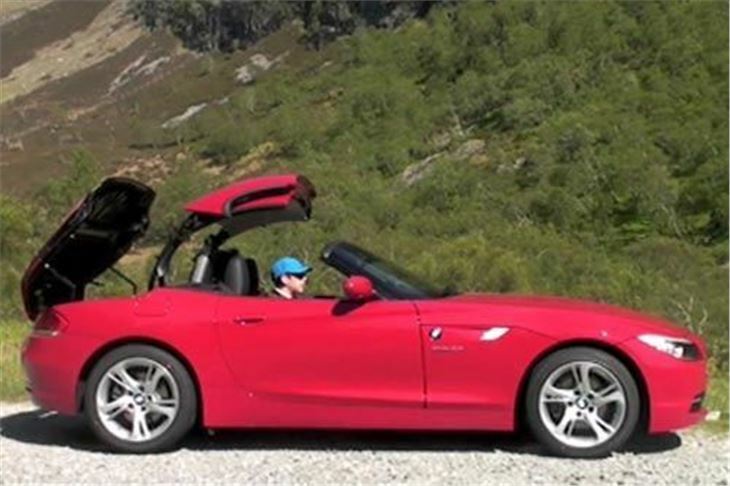 But since the new BMW Z4 has an electric folding hard top it’s a replacement of both the previous Z4 roadster and sadly also of the sensational looking Z4 coupe I tested back in 2006. 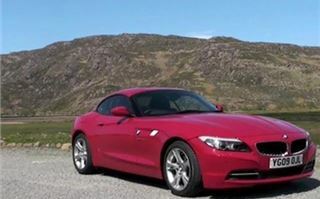 So each new Z4 is two cars in one. The electro hydraulic retractable hard top is a work of art in itself. First, the rear section and back window rise up over the roof, then the trunk lid opens and the top stows inside the trunk. 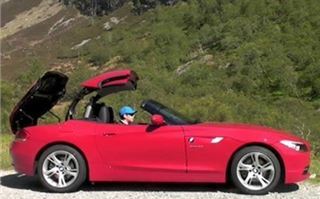 We timed the whole operation at just 18 seconds and, very usefully, once the roof is stowed, the generous 310 litre trunk capacity is only reduced by 130 litres to 180 litres, so leaves enough room for two people’s bags. Top up, the width of the trunk allows easy stowage of golf clubs. 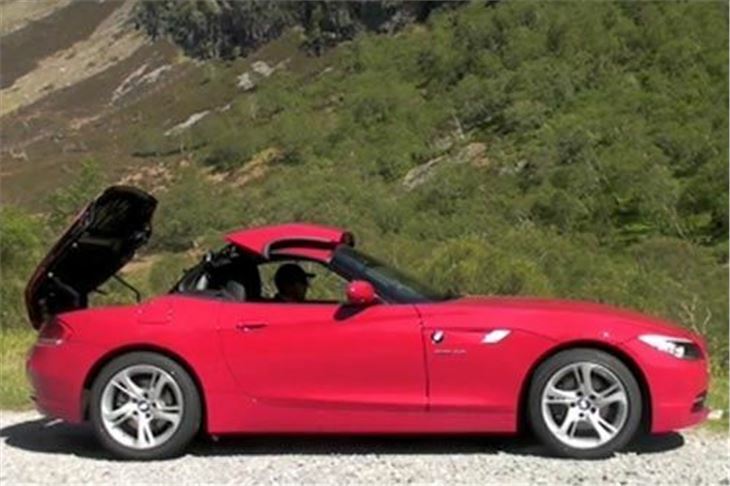 The car is slightly longer, wider and higher than the old Z4. And tough its obviously just a two-seater, the cabin feels reasonably spacious, the seats are comfortable and even on 18” wheels with the optional active suspension set to sport + the ride is not too bone jarring. New wide screen satnav (a £1,950 extra) sits on top of the dash. 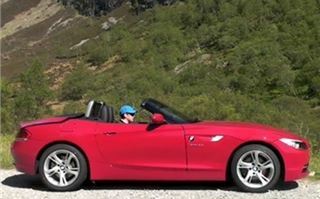 And, with the rear wind deflector in place, you don’t get badly buffeted driving top down, as we were most of the day. Initially there are three engines on offer, all straight sixes. A 2,496 cc 23i, developing 204PS at 6,400rpm. An Efficient Dynamics 2,996cc 30i with 258PS at 6,600rpm (slightly down on the old Z4’s 3.0i). 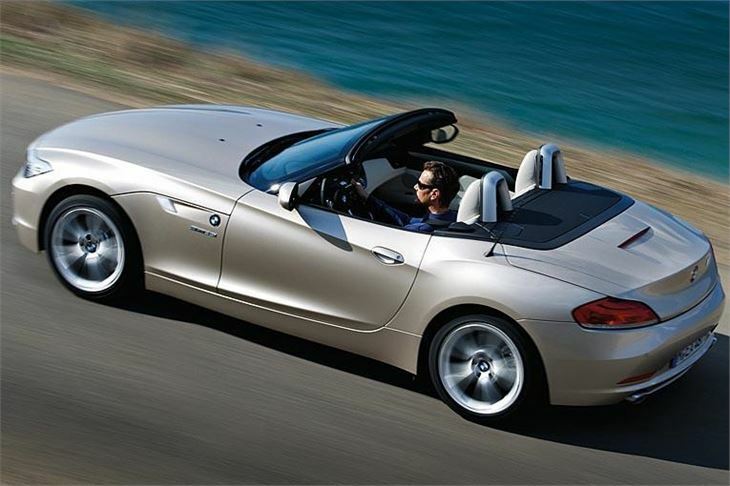 And BMW’s award winning 2,979cc 35i twin-turbo pumping out 306PS at 5,800rpm and a muscular 400NM torque from 1,300rpm to 5,000rpm. All are EU5 and come with a precise 6-speed manual or an optional 6-speed torque converter auto for the first two or a Getrag developed twin shaft, twin clutch 7-speeder for the 35i. The 35i DCT pulls 60 in under 5 seconds, which is not exactly hanging about, and does a standing kilometre in 24.2. 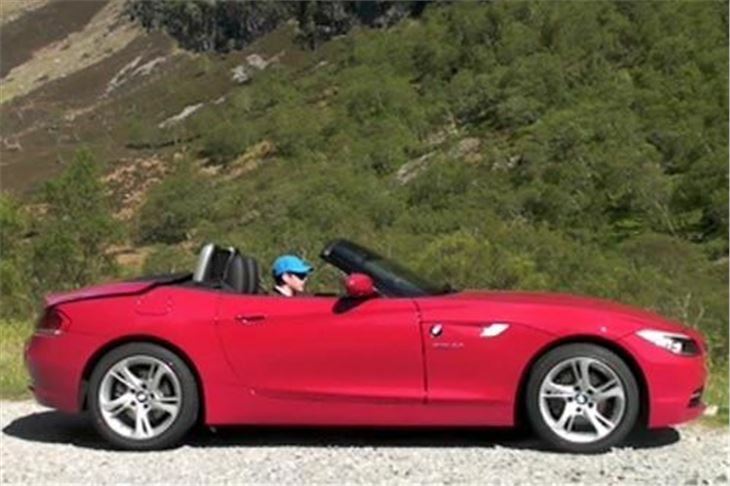 The fast shifting 7-speed box makes the car more economical than the manual and frees up your left foot to concentrate on braking to get the nose down and the weight transferred for corners. Even so, at serious speed, the front end floats a bit too much for my liking and, though the steering has a bit more feel than the old Z4, the bigger the wheels and the lower the profile of the tyres, the less feel feeds through to the steering. Though the front end never actually wavered on our drive, I just didn’t feel I could trust it with my life and those of oncoming motorists. Though, of course, if the politicians go and impose a 50 limit everywhere and find some nasty new way of enforcing it, then how good any car feels at speed will become completely irrelevant. 7th gave about 30mph per 1,000rpm for cruising. While the twin turbo 35i spins up to maximum revs faster, the 23i actually develops its power at higher revs. 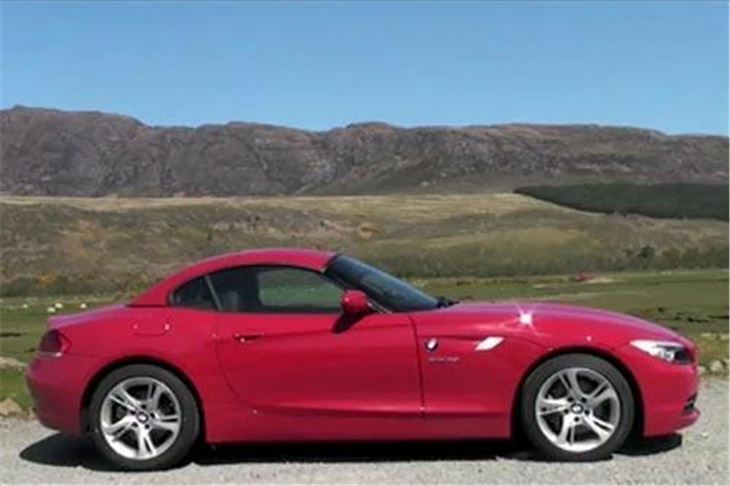 This, coupled with the 6-speed manual box and more sensible 17” wheels, makes it a much more enjoyable sports car. With just 204PS v/s 306PS, it’s obviously slower (actually 6.3 seconds to 60, so not that slow), but more satisfying. The engine has a wonderful BMW straight six turbine-like smoothness, and quite a nice noise, too. I found I could drive it quickly, or settle back to the speed limit and enjoy the open air. It still isn’t cheap. At £28,645 before you start adding any options, it’s already in Nissan 370Z territory and it’s nothing like as well developed as a sports car. 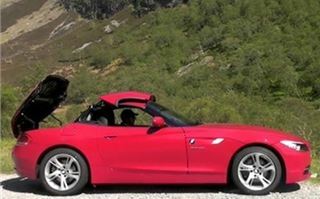 But it does have that incredibly neat electro hydraulic folding hardtop that means you can park it anywhere without worrying about getting the top slashed. 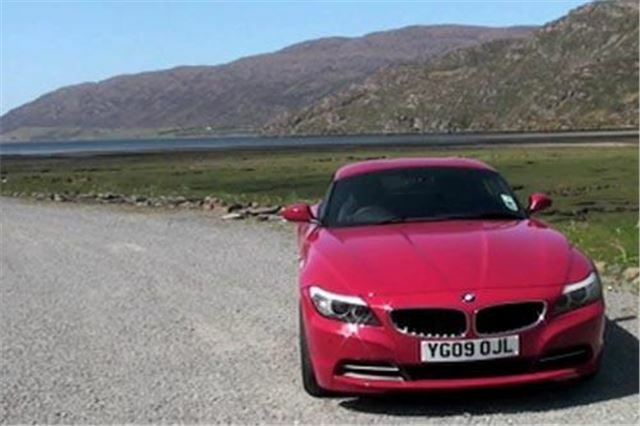 And, because it’s less tempting to drive quickly, it’s a more sensible choice than a 370Z. It’s also 199g/km, so still in a sensible VED and BIK bracket. And not in any way effeminate, like the gorgeous looking but slightly flawed Mercedes SLK. 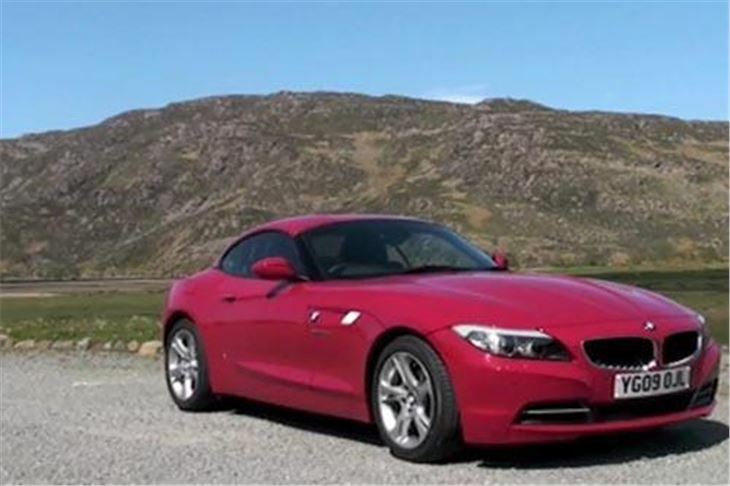 So, of the Z4 35i and Z4 23i, the 23i would be my choice. I could see myself using it as a day-to-day car. Something I couldn’t imagine of a 370Z, a Boxster or a Cayman. Yes, definitely a car for the male meno-porsche.